Despite the possibility of fielding outdoor baseball and growing real grass, traditionalists and ballpark critics alike have criticized some of the new retractable roof ballparks. Every modern retractable roof ballpark, except Safeco Field, has routinely landed at the bottom of the ballpark rankings. Safeco gets a pass because it maintains a permanent outdoor feel, with its “umbrella” style roof that doesn’t enclose the park. First of all, it is important to acknowledge some of these ballparks were absolutely necessary. The summer climates in Houston, Phoenix, and Miami undoubtedly demand indoor baseball. Safeco Field is the only one that gets great reviews. Safeco Field was debatable, but I can certainly understand it because the rain patterns are unpredictable. That being said, the data doesn’t lie: the rainy season is in winter and annual rainfall in the summer months is very similar to large Northeastern cities. Miller Park was also debatable: other open-air ballparks with similar climates have been successful and are much more aesthetically pleasing. Both the Brewers and the Mariners fairly counter that a large percentage of their fan bases travel a great distance to see the game. 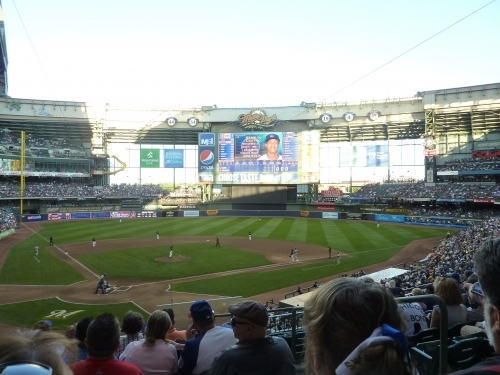 While they obviously have their functional benefits, Miller Park, Minute Maid Park, and Chase Field have been criticized for feeling like “airplane hangers.” Critics have claimed they boast an undesirable “mall like” atmosphere. They say baseball should be played outdoors, and having a roof looming over the field hurts the ambiance in any circumstance. Even when open, Miller Park and Chase Field both have enclosed vibes. 1) Architectural incongruence: Simply put, the retro look and a modern retractable roof often appear mutually exclusive. There’s nothing like seeing a state-of-the-art jet-black roof on top of a brick façade. It’s a hotchpotch of conflicting elements. Safeco Field (especially), Miller Park, and Chase Field go in this unfortunate category. Amazingly from my experience, regardless its aesthetic merits, Minute Maid Park does not. They managed to create a retro roof as well that fits perfectly with the train motif. New Marlins Park has a modern design, thankfully. 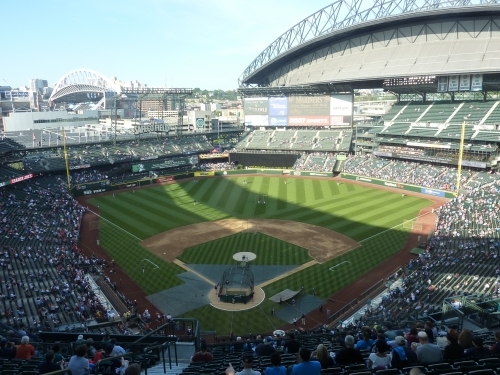 2) Enclosed, gym-like atmosphere: While Minute Maid Park and Safeco Field employ a sliding roof that is well connected to the outside when opened, Miller Park and Chase Field still feel fairly enclosed when opened. When closed, all except Safeco Field will inevitably have a gym-like atmosphere. However, that doesn’t mean these can’t be good ballparks. It will be interesting to see where Chase Field, which is at the bottom of the consensus, will end up in my ratings. It’s not all about aesthetics: Chase Field apparently has great sightlines and is packed with amenities. Chase Field and Safeco Field have remarkably disjointed exterior aesthetics. That being said, while it is certainly possible to execute a good interior design, aesthetics are still consistently diminished with the addition of a roof. Ballparks are about connection to the local context. It should be a vehicle of attachment between the fan, the players, and the local community. A retractable roof inevitably decimates that connection and draws a wall of separation between the ballpark and the environment instead of cultivating that harmony. Perhaps new technology will eliminate this separation, like the proposed, now abandoned Rays Park. In my opinion, Minute Maid Park is by far the most attractive retractable roof ballpark and the only one that has any aesthetic vision. But subjectivity aside, it succeeds because 1) it’s the only one that has a good urban design connected to it’s context and 2) its the only one that is aesthetically consistent in it’s design principles. These parks can be great structures, but as of now, they inevitably have aesthetic limitations.